An Update on my Sweet iPhone Setup – Sanspoint. I’m a born fiddler, and in my computing setup, the one thing I fiddle with the most is my iPhone. 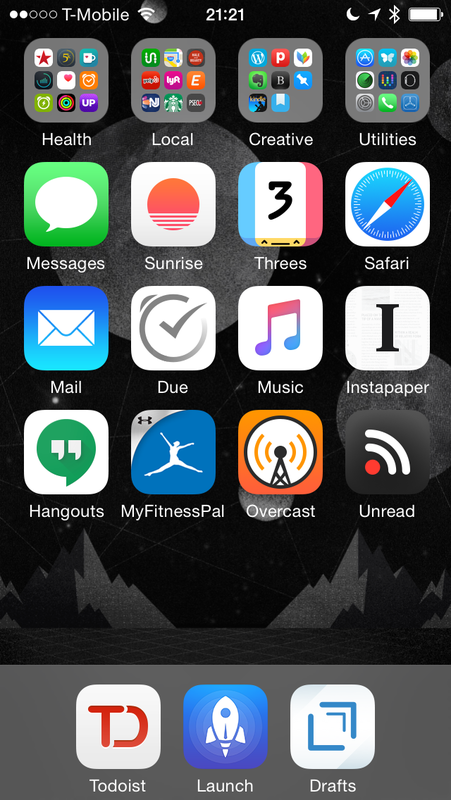 I switch out apps, rearrange icons, and experiment with various home screen layouts for usability and aesthetics. The only thing that’s stayed the same for more than six months on my iPhone is the presence of Launch Center Pro and Drafts in my dock. Since my Sweet Setup interview, I’ve set up my iPhone in the style of CGP Grey, as explained on the first episode of Cortex. Each icon column is broken out by type of app. From left to right: communication, time and health, entertainment, and reading. I’m not as ruthless about as CGP about what I allow on my device, but I am trying to be more conscientious about it. I’m also trying to move back towards Apple stock apps. Mail.app is much improved, and the native experience is great. If only there was a way to use gMail aliases with the built-in gMail support. Instead, I have to set up my personal mail as an IMAP account, and manually move messages around. While I try out Apple Music, it’s taken the place of Cesium on my home screen. I have mixed feeling about the service, and I don’t know if I’m going to be keeping it after the three month trial yet. Still, I bet Cesium will be there if I go back. Since I’m switching back and forth between a Windows PC at work and my Mac and iOS devices everywhere else, I needed a cross-platform task manager. OmniFocus wasn’t fitting the bill, so I went with Todoist. I’m liking it enough that I sprang for the premium option, too. So far, it’s been the stickiest of the various task management tools I’ve tried. I can see why Federico Viticci likes it. Another major change since the interview is in fitness apps. After the weaknesses of the Pebble as a fitness tracker became all too apparent, I had to rethink my fitness setup, and then do it again after I dropped Jawbone like a bad habit due to some bad software updates. I’m back to giving it a try for insights in my Apple Watch-tracked fitness, but it’s on probation. For caffeine tracking, I’m rolling with Caffiend, and I’m using Sleep Cycle and Power Nap for sleep tracking. And I’m also back into running, with the awesome, Sweet Setup approved Run 5k app. I’m in Week 7 now. I’m not doing any goal tracking, at the moment, though, as I’m not happy with any of the options out there, and I’ve tried almost all of them. That’s about all the major changes since my Sweet Setup interview: organization, fitness, and no more Pebble. I told you I was a fiddler.